Fire station closest to Lawrence senior living complex fire couldn't respond, but would it have helped? Crews with the Lawrence Fire Department worked on extinguishing a large fire Monday afternoon at a senior living facility. LAWRENCE — A Lawrence fire station that hasn't been staffed in years is right down the street from Monday's large fire that displaced dozens and two councilmen say if that station had been in use, there would have been far less people left homeless before the holidays. The fire on Benjamin Court was just up the road from the unused Fire Station 40. The station hasn't taken runes since 2013, and Councilmen Bob Jones and Rick Wells say Fire Station 40 maybe 150 yards away, and could have made an impact on the damage that was done. "Is it possible the building would not have sustained so much damage had this building been open? In proximity, it only makes sense with it being right across the street. 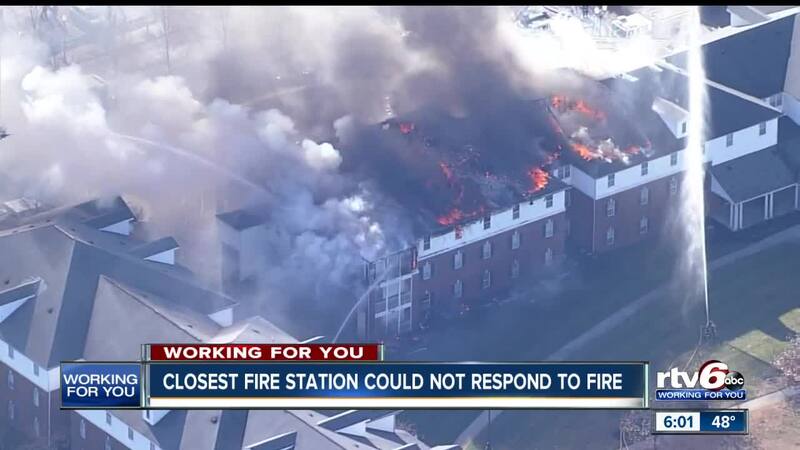 The fire trucks and apparatus could have responded a whole lot quicker," Wells said. "Of course it would have been, if it was fully staffed," Jones said. "It's a stones throw away. Our emergency team could have bene there quicker. Yea, if it was fully staffed it definitely would have been a quicker response." No one was injured in the fire at a senior living facility near Fort Harrison State Park, but dozens of residence were displaced. Mayor Steven Collier praised his department's response to the fire and says that having Station 40 open would not have made a significant difference in their response time. "I don't know how it could have been any quicker than it was," Mayor Collier said. "We were there within two minutes of the 911 call. We had a battalion there." Mayor Collier does say that reopening Station 40 is on his rader, but to open it he would have to hire 7 firefighters at a cost of $700,000. He says that could happen in the next two to three years. "We need to learn from this situation," said Jones. "What we did right and what we did wrong so it doesn't happen again."